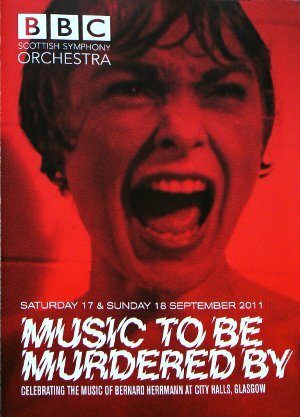 Saturday, 17th September saw the screening of Alfred Hitchcock’s 1960 film Psycho with live accompaniment of Bernard Herrmann’s influential score. Under the guidance of conductor John Wilson and in the red-tinged setting of the Glasgow City Halls, the strings of the BBC Scottish Symphony Orchestra (BBC SSO) earned their crust with a thrilling evening of vintage Herrmann, doing justice to the film composer’s music from the furious main titles’ opening sequence, through to the final low, unresolving dissonance of the final scene. Herrmann gave himself problems when he decided to limit himself to composing a string-only score for Psycho (the score is orchestrated for 50 performers; 14 first violins, 12 second violins, 10 violas, 8 cellos and 6 double basses). 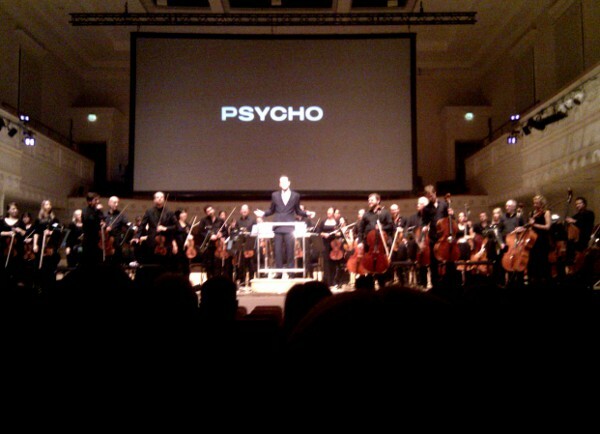 He limited himself in the amount of orchestral colouring he could call upon and he also denied himself of a lot of the conventional techniques used by others for films of the same genre as Psycho. But Herrmann’s inventiveness used the strings in ways that had not been considered up to that point. (Note: I don’t have the musical knowledge to enter into a discussion of what and how Herrmann did what he did – there has been volumes written on Herrmann’s score for Psycho. This is really only a comment on my experience of “Psycho: Live”. On the night, with Wilson and the BBC SSO tight, dynamic and animated performance, they highlighted ably how Herrmann was able to provide Hitchcock with a score of top quality.